Back-to-back weeks where I write the football picks? Why should you be so blessed? 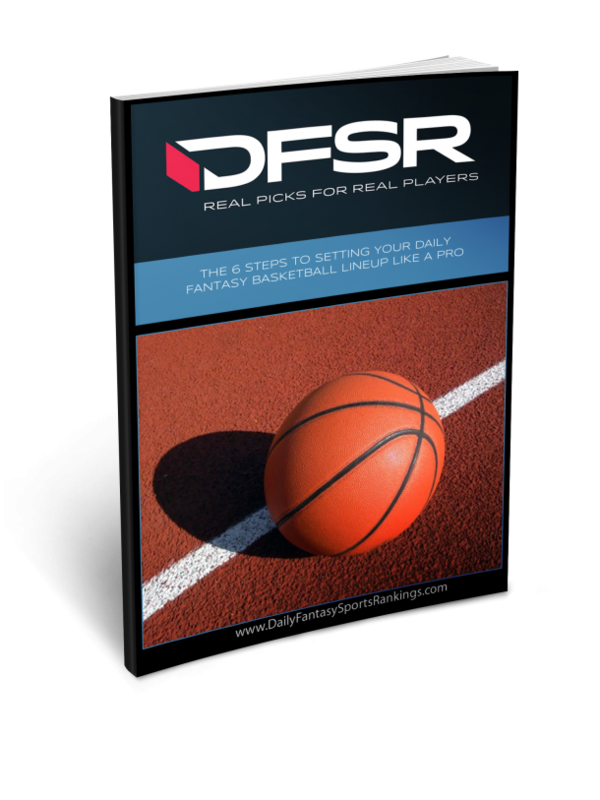 With NBA season back and ready to fire on all cylinders, it's an all hands on deck situation here at DFSR. Last week was a funny one - we hit on some high value targets, and had some notable misses as well (like Jameis on DK but not on FD). But that's the nature of DFS, and we're back to the grind and ready to turn in a winner for week 7. Jameis was the chalk quarterback play in Week 6 and didn’t disappoint. He led all QBs in fantasy scoring with 395 yards and 4 touchdowns through the air. He also picked up 31 more on the ground in the loss to the Falcons. He doesn’t get quite the same matchup against the Browns this week, but Tampa Bay still comes in with the third-highest implied total of the main slate (26.25) as three-point home favorites against the Browns. It’s tough to imagine the Bucs getting all that much going on the ground and should have to rely on Winston’s arm (and legs) throughout. In his first 1.5 weeks back since the suspension, Jameis has completed 75% of his passes which makes the four interceptions look a lot more like bad luck than bad decision-making. That number should come down and we could see Winston as a chalk QB play again on the main slate. He’s probably a little too expensive on FanDuel, but the sub-6K tag on DraftKings looks solid for Cam even facing off against the Eagles. From a cash game perspective, he has such a high floor. Through the first five games, he’s rushed less than eight times only once and is averaging 9/42 on the ground this season. He’s the top running quarterback and it isn’t all that close. Those running numbers do help make up for the fact that he hasn’t been a prolific passer (and probably never will be). But he’s still averaging 231 yards per game through the air. The Eagles have quietly been a bottom-third defense in terms of yards given up this season and have been below average against the pass though have faced some tougher passing attacks in the Falcons, Bucs, and Vikings. Again, the FanDuel price seems out of bounds, but fire the guy up on DraftKings. Since his highlight-reel second half against the Jets in Week 3, Mayfield has gone through some growing pains for sure. He’s completing only 55% of his passes with four TDs to five interceptions. But if there’s a week to turn things around, it’s this one. He gets the league’s worst pass defense in the Bucs who’ve allowed a staggering 356 yards per game through the air. That’s 16 more yards per game than the next closest team (the Chiefs) and 58 more yards per game than the third-worst team (the Saints). The Bucs’ insistence on stopping the run has led to just unreal opposing quarterback play. Through the first six weeks, only Nick Foles has less than 28 DraftKings’ points (20) against the Tampa. Mayfield is the 13th most expensive QB on FD (8th on DK). It’s closer on the latter where I might take Cam’s floor. But there’s no denying this is an ideal matchup for the rookie to put up big numbers. Gurley touched the ball 33 times (28 carries, 5 targets) in Week 6 and his price actually dropped $200 on DraftKings for Week 7. FanDuel finally got with the program, increasing him from $9500 to $10200 and he still makes for an easy play over there. With more teams on byes and an early game in London, the running back player pool looks incredibly thin going into this week (short of hearing some significant injury news between now and Sunday). That leaves Gurley as the easy, high-floor play for cash games. He’s the runaway leader in usage (carries + targets) at 26.5 per game with the next closest guy (Zeke) a full 8% lower (24.5 touches). After that, the list really drops off a cliff for this main slate. Paying a premium on Gurley is completely in order and I think we see him as once again the overwhelming chalk. The Rams are -10 road favorites against the 49ers who’ve been okay against the run, but not to the point where we need to avoid matching RBs against them. It might wind up being a little tough to pay up twice at running back, but that is where our system is leaning if we don't get news of some unforeseen opportunity. An really, Elliott isn't a bad consolation prize. He's maintaining the absurd usage that earned him a $9k+ price tag in the past, but you're still getting him at these reduced prices. With 29, 27, and 25 touches in the last 3 games Elliot leads all NFL running backs over that stretch. And yes, the Dallas offense has struggled, but he's still averaged 20+ fantasy points over that stretch. He's been fairly game-script proof, with Dallas turning to him through the air even when they are behind. Washington has been slightly better than league average against the rush this season, but they've played some pretty uninspired rushing attacks in Arizona, Indy, Green Bay, New Orleans, and Carolina. The last two teams feature good running backs, but McCaffrey and Kamara are mostly interesting because of their pass catching ability. The Skins are slightly favored here, but I'm not worried about blowouts, and I'm not worried about Zeke's opportunity - something I can't say for most backs on this slate. So from here things get a lot murkier. You'll want to start by keeping your eye on TJ Yeldon and Latavius Murray. Both will be strong options if their starting counterparts are still injured, and unplayable if the starters return. Outside of them, there are a couple directions you could go. Do you trust Christian McCaffrey based on the receptions, or are you nervous because he got 8 carries last week? You could play Sony Michel, but he's really only running the ball, he's got a tough match-up with Chicago, and New England is notoriously flaky with running back usage. 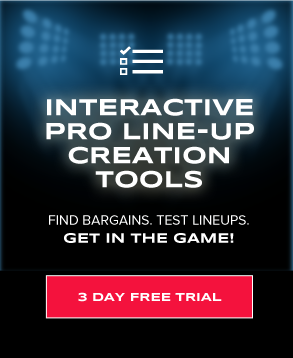 Our DraftKings tool is trying to fish for value with guys like Wendell Smallwood or Adrian Peterson. Both have shown flashes, but can you really trust the usage of either? All in all, it's a very difficult week to parse at running back for the main slate, and you're going to want to pay close attention to injury news as the week progresses. If you had Adam Thielen as the NFL’s target leader through six weeks then congrats. His 81 targets are nine more (or a really good WR game) than Antonio Brown’s 72 and Thielen’s 73% conversion rate is also the very best among the top 10. We gave you Thielen over Brown and Julio last week, and it worked out swimmingly. He’s been the best WR around and there’s no reason to suspect much of a drop off in production. He has Diggs and Rudolph to keep defenses honest, and Cousins clearly views him as the WR1. Considering he lines up mostly in the slot, Thielen stands to see the Jets’ Buster Skrine a majority of the time, who just happens to be lowest-rated Jets’ CB. This is another fantastic spot for the Vikings’ star and I still don’t think we’ve seen the peak price for the guy. We were in the minority playing Thielen in cash last week and could be again as folks adjust to the price increase without fully recognizing how great he’s been this season. The Rams’ WR corps has been tough to get a handle on mostly because they are so deep with three elite guys plus a RB in Gurley who catches a ton of balls out of the backfield. But it looks like LA will be without Cooper Kupp this week, which should open up more targets for Woods and Cooks. Both are priced in the upper-middle tier, so it isn’t like we are getting tremendous discounts on their production, but these prices aren’t accounting for a redistribution of Kupp’s eight targets per game. From a possession standpoint, Woods appears the safer play. He’s averaging 8.5 targets per game (median 9 targets) and should see a slight increase in Red Zone usage without Kupp. That being said, Cooks makes for an excellent play in his own right. He’s third on the team in Red Zone targets (behind Gurley and Kupp) and his 12.95 yards per target is third in the NFL this season. He’ll also line up on the left side more, thereby avoiding Richard Sherman which is considerably better than the Ahkello Witherspoon side of the field. All in all, choosing between these two guys won’t be easy and stacking both with Gurley would seem a high floor play if you could make the salaries work. Also strongly consider Josh Reynolds if he’s in line for all of Kupp’s WR snaps. Quincy Enunwa is hurt and looks unlikely to play this week. Even before that injury, Kearse was starting to look like a solid bargain on both sites. The primary reason was the Jets moving Enunwa out of the slot and moving Kearse there. The latter saw ten targets last week, good for a 9/94 line. While this could look like something of an overreaction to a one-week sample size, it is encouraging that Enunwa’s target share was significantly better when he ran out of the slot and that seems a place Darnold is comfortable throwing. This isn’t a good matchup for Kearse considering the Vikings have a very strong CB corps. But if we are looking for increased opportunity coming on the cheap then Kearse does quite a bit to help fit salary in lineups. Strongly consider Jarvis Landry for the same reasons as Mayfield above and Njoku below. We gave you Njoku as the best tight end play last week, and I hope you weren't disappointed. After 7 and 11 target weeks, Njoku topped them both with 12 targets against the Chargers. He turned those targets in 7 catches, 55 yards, and a touchdown - just absurd production on these prices. The price on DK has ticked upward, and the price on FanDuel actually went down a little. All of this in the best possible match-up for an opposing ball catcher. I was surprised by Njoku's relative lack of ownership last week, and I'll be floored if that follows this week. Yep, it's another crazy week at tight end. Reed has been pretty underwhelming with his new QB this year, and his price has dropped as a result. I was ready to pour dirt on the guy after the two target New Orleans game, but the nine targets against the Panthers has me reconsidering. It's easy to forget that Reed has some of the best hands of any tight end in the league, and that he can do a lot after the catch as well. Smith's natural tendency to not throw the ball downfield should theoretically make this a match made in heaven, especially when we think about what Smith was able to accomplish with Kelce. I don't think you play him over Njoku, but it's very possible we see a 10% price increase here if he and Smith get more on the same page. Well, there are basically two other strategies you can employ here. Zach Ertz is a cut above the competition at tight end. He's got 12 more targets than the second place Kelce, and leads the NFL in receiving yards for tight ends as well. He hasn't connected on a lot of touchdowns just yet, but he's a perfect red zone target, and you have to think that will come. If it does, the price will go up. I'm not sure he's a cash game play to me just based on the price, but his floor is plenty high and the ceiling is through the roof. Early returns on FanDuel have us rolling the Redskins, and I can't say I mind it. That game is tied for the lowest total on the slate, and the Redskins are favored. The only team with a lower implied total than Dallas, the Redskins' opponent, are the Texans, who play the Jags. The Jags cost $900 more than the Redskins, and that savings absolutely matters. I'm also frankly more concerned about Watson and the Texans putting up a huge day than I am Dak and the Boys. The Redskins also have allowed the 6th lowest YPA through the air and the 11th lowest yards per carry. They are just an underrated defense at too low a price tag if you ask me. I also don't mind running the Colts against the Bills if you think Allen could implode, and it'd be hard to go too wrong taking the Dolphins against the Lions. If Osweiler starts again, I also would be psyched to run the Lions D against him. All in all, there are a lot of reasonable options there. On DraftKings, I'm really hoping for the chance to roll it back against Osweiler. The Lions are basically free, and I'm not buying Osweiler's 300+ yard game as a sign of things to come. You've also got other cheap options like the Eagles against the Panthers, or the Pats against Chicago, and while both Cam and Trubisky could serve up a great day for an opposing defense, I'll take a crack against a back-up QB any day of the week.